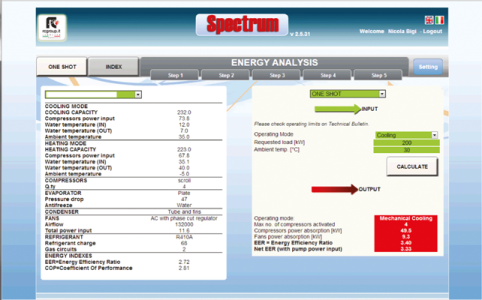 WEB application able to predict the Energy performance of the units (chillers and heat pumps) and to conduct a comprehensive energy analysis. Gross and net EER (chillers). TER (chillers with heat recovery). Gross and net COP (heat pumps, with estimation of defrost for air-towater units). Multiple confi guration of a single model, with parallel or sequential mode of insertion. Comparison of different models on the same application. Complex layout, with machines of different models and size, with sequencing rules in accordance to SEQ functions. Aid in the choice of machines and their conduction. Analysis of return on investment. Easy integration of results into project documentation. Tool to verify predicted performances. • Integration with BMS/SEQ to optimize operational logic.